Following the financial crisis, the regulatory framework for banks has changed substantially. The European Union has taken the lead in implementing reforms agreed globally at the level of the G20 and in the Basel Committee with the objective of reinforcing financial stability, reducing risk in the banking sector, and avoiding that taxpayers have to contribute financially to the costs of failing banks. 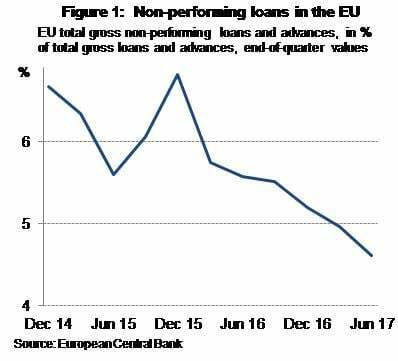 In January 2018 the European Commission presented its first progress report on the Action Plan to tackle non-performing loans (NPLs) in Europe, which Finance Ministers agreed on in July 2017. The progress report of a communication and an accompanying staff working document, highlights recent developments of NPLs both in the EU as a whole and within individual EU countries. The general improvement in NPL ratios over recent years continued in 2017. The quality of banks’ loans portfolios continued to improve. The latest figures confirm the downward trend of the NPL ratio, which declined to 4.6% (Q2 2017), down by roughly 1 percentage point year-on-year (cf. Figure 1). As a result, the ratio reached its lowest level since Q4 2014. The provisioning ratio 6 has also risen, amounting to 50.8% (Q2 2017). NPL ratios have been recently falling in nearly all Member States, although the situation differs significantly across Member States. Several still have high NPL ratios (9 Member States had ratios above 10% at the end of the second quarter of 2017) and others have very low ratios (10 Member States have ratios below 3%). The accompanying Staff Working Document reports in detail on the evolution of NPLs and on policy measures in a selection of countries with high NPL ratios. 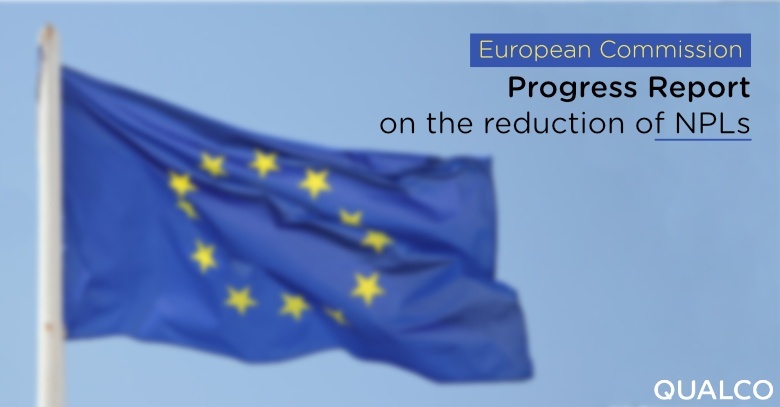 There is evidence of encouraging progress in reducing NPL ratios in these Member States, due to a combination of policy actions and economic growth. However, NPLs continue to pose risks to economic growth and financial stability. The total volume of NPLs across the EU is still at the level of EUR 950 billion, clearly above pre-crisis levels. Structural impediments continue to hamper a faster fall in NPL stocks. Among other elements, activity on secondary markets for Non-Performing Loans is not yet sufficient to substantially contribute to NPL reduction efforts, notwithstanding the increased interest from certain investor groups and the increasing volume of NPL-related transactions. Moreover, debt restructuring, insolvency and debt recovery processes are still too slow and unpredictable in some cases. In line with the overall significant progress on risk reduction in the EU banking sector, the ratio of NPLs continues to decline in the Union. Despite this positive trend, high NPL ratios remain an important challenge for several Member States and for the Union as a whole. The Action Plan, agreed by the Council in July 2017, was a major step in addressing this challenge. This first assessment shows important progress is being made in the implementation of the Action Plan. It is necessary to maintain this pace of progress in implementing the Action Plan in the coming months and years, if the challenge of high NPLs is to be addressed both in terms of reducing existing stocks to sustainable levels and preventing any future accumulation. While work needs to continue at a sustained pace at the level of individual banks and Member States concerned, continued concerted action by the Commission and other EU institutions, including the European Central Bank, is required at EU level. The Commission will present a dedicated package of measures in spring 2018 including a number of legislative proposals to facilitate the management of NPLs by banks and avoid the accumulation of new NPLs in the future.